Cool, sporty look combined with Swiss watchmaking. The Chronograph Heuer Skipper was specially developed for yachting. Here for sale the reference 1564. Only few pieces of this exclusive stopwatch were produced. Today they are coveted collector's items. The large, three-color minute counter at 3 o'clock is the trademark of the Skipper. At the start of a regatta, the sailors are able to count down 15 minutes before they are allowed to cross the start line. This particular Heuer Skipper 1564 is from 1971. The most exciting thing about this watch is its excellent condition. The blue dial is absolutely gorgeous without any quirks. The original tritium lume is fully intact in the hour markers and hands. The cushion-shaped (or tonneau-shaped) case is unpolished and untouched. The surfaces of the lugs still have their original brushed finishing. The important numbers are clearly readable between the lugs. The blue, rotating bezel is just perfect. The pearl at 12 o'clock is intact. Especially the case back proves that this Skipper was hardly worn. There are no signs of wear or scratches. The winding crown is HEUER signed. The reference number of this skipper is 1564. However, the number 1163 is engraved between the lugs. The reason: The Skipper had no own case. 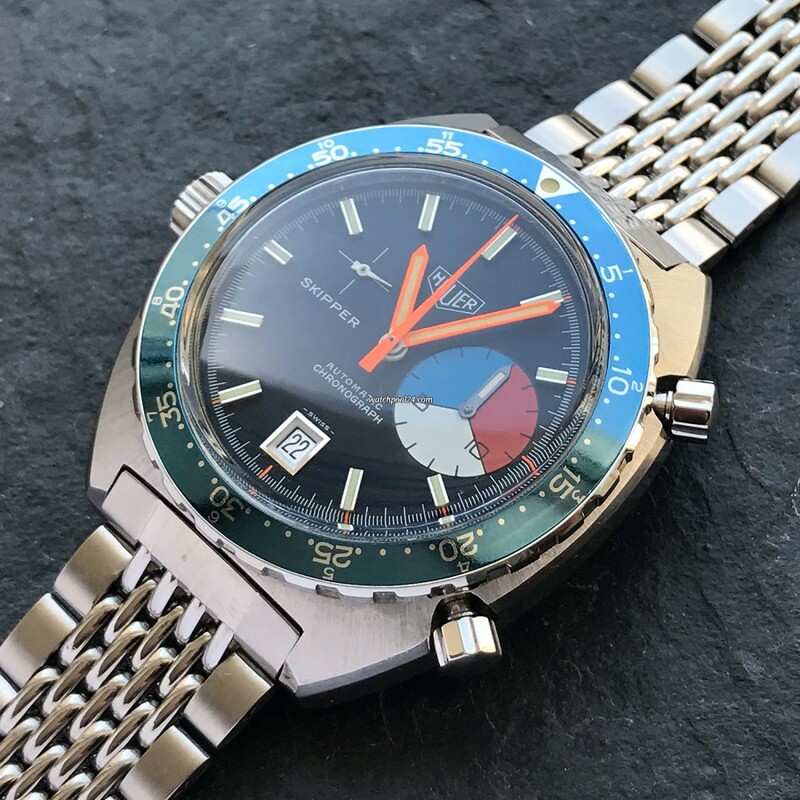 Instead, the case of the Heuer Autavia 1163 was used. The heart of this reference 1564 is the automatic movement Heuer Caliber 15 with the date feature. All functions have been checked and run smoothly. The watch keeps good time. Another highlight is the original Gay Frères bracelet, which comes with this Skipper. The clasp is signed with the Heuer logo. These beautiful bracelets are very rare and sought-after by watch collectors. Today the prices only for such bracelet without the watch are very high (2000 - 3000€). With this Heuer Skipper 1564 you are sure to attract the attention of all watch enthusiasts. Further this watch has a high collector value due to its excellent condition.